Retired SketchUp Blog: Look who's modeling! 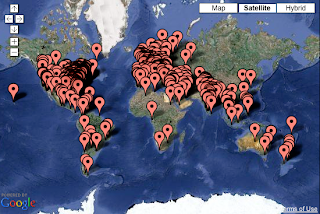 The Google Model Your Town Competition is running full-steam ahead with over 400 pins in the world map representing teams from six continents. From places like Cauquenes, Chile to Cape Town, South Africa to Suva City, Fiji to Alirajpur, Madhya Pradesh, India to Aberdeen, Scotland to Tallin, Estonia and Burlington, Iowa people have taken on the challenge of representing their communities. Folks in Iowa, Colorado, and British Columbia are motivating community members by building their own websites, garnering local press, tweeting, and soliciting help in online forums. Some are offering training on how to model to anyone interested. Iowa is asking middle and high school educators to form and advise teams of students. There are still many people looking for team members. Visit the official group to meet folks in your area, or to post your own questions, ideas, or comments about the competition. The deadline for entering is March 1st of this year. Start the entry process by adding a pin to the map on our Get Started page and follow us on Twitter @modelyourtown. I can see that you are putting a lot of time and effort into your blog and detailed articles! I am deeply in love with every single piece of information you post here. Will be back often to read more updates! Please come visit my site Tucson Phone Book when you got time. I can see that you are putting a lot of time and effort into your blog and detailed articles! I am deeply in love with every single piece of information you post here. Will be back often to read more updates! Please come visit my site Tucson Business Directory Forum Blog Classifieds when you got time.